Fort Jefferson, built in 1861, was a Navy base until World War I. 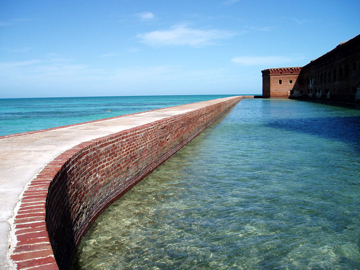 Today, it is part of Dry Tortugas National Park. The Florida Keys are one of the most ephemeral places on Earth. The majority of the planet’s landmasses are millions of years old, but these islands have only been around for a few thousand years. And rising sea levels are already threatening to submerge the young archipelago, possibly within the next century. For eons, the barrier islands and ancient reefs now known as the Florida Keys lay beneath the warm, nutrient-poor waters off North America’s southern coast. Over thousands of years, underwater sedimentary deposits formed a thick layer of sand and limestone on the seafloor. Once the carbonate base built up from the seafloor high enough to reach sunlight, corals began colonizing the mounts. As colonial corals grow, they secrete a calcium carbonate skeleton to encase their soft living parts, the polyps. The polyps share their limestone home with single-celled algae called zooxanthellae, which produce food for the polyps using photosynthesis. The algae can supply up to 90 percent of a coral’s nutrients, enabling it to thrive in warm, nutrient-poor waters. Over time, coral skeletons can build immense reefs, which support oases of biodiversity in otherwise barren oceans. The Keys’ ancient coral reefs, built mainly by elkhorn, staghorn, brain and star corals, flourished for millions of years until around 100,000 years ago, when Earth’s climate entered a cooling period and its polar ice caps began to expand. As the ice sheets grew, they locked up water from the oceans, lowering the sea level by as much as 100 meters and exposing much of southern Florida and the Keys. Tarpon, the "silver kings of the sea," are prized game fish in the Keys; some tarpon also hang around Robbie's restaurant on Islamorada hoping for handouts. Today there are 882 charted Key islands, 30 of which are inhabited. The 204-kilometer-long Overseas Highway, a concrete marvel of bridge engineering, connects the island arc from Key Largo in the northeast to Key West in the southwest. A drive down this aptly named wave-top-skimming road is a great way to tour the Keys’ unique coral geology, tropical ecology and island-life culture before it all returns to the sea. Key Largo, the northernmost Key, is the gateway to the rest of the island chain. The town itself is home to some unique diversions like the Caribbean Shipwreck Museum and up-close-and-personal dolphin encounters at Dolphins Plus, Inc., and the Theater of the Sea. However, Key Largo’s best entertainment is offshore; some of the world’s best scuba diving and snorkeling can be found on the reefs a few kilometers east of the island. Molasses Reef, French Reef and the Grecian Rocks are three popular dive sites and Spiegel Grove features a sunken 155-meter-long Navy ship that now hosts a spectacular artificial reef. Dozens of diving guides can be found in Key Largo: Horizon Divers, Ocean Divers and It’s a Dive are three reputable companies. If diving all day isn’t enough for you, check out the Key Largo Undersea Park, where you can stay underwater all night in a submarine hotel room. Driving south from Key Largo you will pass a handful of uninhabited mangrove islands and Windley Key, which boasts the islands’ highest elevation: five and a half meters above sea level. 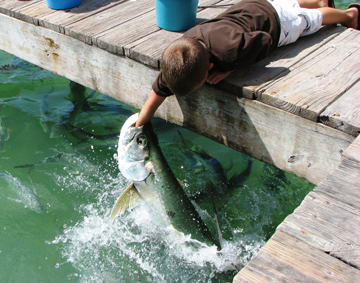 Soon you’ll come to Islamorada, the “Village of Islands.” Stop at Robbie’s for lunch and after you eat, buy a bucket of baitfish and head down to the docks to feed the resident tarpon. As many as a hundred of these massive three-meter-long sport fish gather at the Robbie’s docks everyday looking for handouts. Toss a baitfish into the water or, if you’re really brave, have somebody hold your feet while you dangle a fish out over the water to see the tarpon jump. 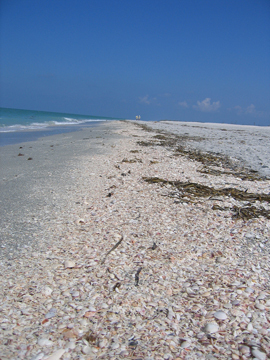 Bahia Honda State Park offers camping and some of the Keys' most beautiful crowd-free beaches. The Islamorada area is home to six state parks, two of which — Long Key State Park and Curry Hammock State Park — allow camping. Hotels in the Keys tend to be very nice but very expensive. Both tents and RV’s are welcome at these lovely and affordable white sand beach and mangrove forest campsites. If you’re looking for a spot to swim, keep driving south to Bahia Honda State Park, home to one of the world’s most beautiful tropical beaches. South of Islamorada, in Marathon, you’ll pass one of the Keys’ two airports. This is your last chance to stop for restrooms, food or gas because once you leave, you’ll spend the next ten minutes driving suspended over the ocean on concrete pylons. The Seven Mile Bridge was one of the longest bridges in the world when it was built in 1936 to connect Knights Key (home of Marathon) and Little Duck Key. The scenery from the bridge is some of the best in the Keys. With the Atlantic Ocean on your left and the Gulf of Mexico on your right, the expanse of sea and sky is only broken by the narrow highway, tiny wild-mangrove islands and the occasional boat. 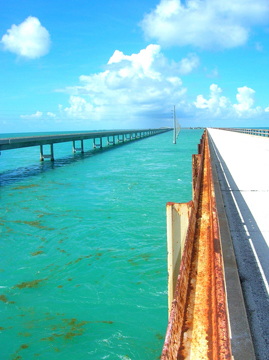 The Seven Mile Bridge marks the boundary between the Upper Keys and the Lower Keys, a boundary also defined by a distinctive change in geology. While the Upper Keys sit atop an exposed coral reef, the Lower Keys are composed of oolitic limestone. Over time, as the Upper Keys’ limestone and coral were slowly eroded back into the shallow sea, bits of calcium carbonate aggregated together with bits of shells to form little pebble-sized spheres of limestone called oolites. The oolites were then deposited onto the deeper, coral-free limestone bedrock that now makes up the Lower Keys. Once the Upper and Lower Keys were exposed, sand, soil and organic material began collecting on the surface, eventually forming islands. The new land was then colonized by salt-water-tolerant mangrove trees and other plants. The Keys’ tropical climate defines the far northern range of many tropical species not found anywhere else in the United States. Today, the uninhabited mangrove islands to the west of the Seven Mile Bridge are home to many species, including the residents of the Great White Heron National Wildlife Refuge and the National Key Deer Refuge. Miniature Key deer are unique to these islands, along with many other species of animals and plants. The Key lime tree is another native and Key lime pie was originally concocted in these islands. The almost 100-year-old Seven Mile Bridge, shown here to the right of the new span (which was completed in 1982), is on the National Register of Historic Places. A 4-kilometer segment of the old bridge is open for biking, walking and rollerblading. Key West is the southernmost city in the United States and, aside from uninhabited Marquesas Keys and Dry Tortugas Island, it is the last Key. It is also the most populous, home to 32 percent of the Keys’ 80,000 residents. Its most famous denizen was probably Ernest Hemingway, who owned a home here for 30 years. Every summer Key West hosts a Hemingway festival for three days, ending on the author’s birthday, July 21. The Papa Hemingway Look-Alike Contest is the biggest event, drawing more than 150 white-bearded contestants. Hemingway’s house on Duvall Street is now a museum overrun with dozens of descendants of the writer’s favorite six-toed cat, Snowball. Other attractions on Key West include the Key West Butterfly and Nature Conservatory, a botanical greenhouse home to thousands of butterflies from 75 different species, several beautiful beaches and excellent offshore diving. Dry Tortugas National Park, 113 kilometers offshore and accessible only by boat, is considered one of the most remote and pristine parks in the United States. Sport fishing is also a popular activity here; try topping Hemingway’s massive sailfish, which is still on display at his favorite haunt, Sloppy Joe’s Bar and Restaurant on Duvall Street. Sloppy Joe’s décor has remained the same since Hemingway lived here, but other more insidious changes are now threatening the islands. Tide and sea levels have been monitored at Key West for decades. Long before Hemingway’s time, sea levels were rising at a relatively slow rate of 60 centimeters every thousand years. Now, seawater is lapping measurably higher and higher up the shores every year: 23 centimeters higher than it was in 1930, according to geologist Harold Wanless of the University of Miami. At that rate, there’s no telling how long the “Conch Republic” will remain above the waves. The Florida Keys are a popular year-round vacation destination — though be cautious if you travel during hurricane season, which runs from June 1 until Nov. 30. The 204-kilometer-long drive can be done in a day, but it’s better to savor the trip over two or three days. Other travel options include booking a cruise to any of the islands or a flight to either Marathon or Key West.